It’s official: After a successful two-semester pilot program during the 2015-2016 academic year, Emory University will switch from Blackboard to the Canvas learning management system (LMS). The new cloud-hosted Canvas by Instructure system will be fully available by the start of the fall 2016 semester. Blackboard, which has been used widely at Emory for the past 13 years, will also remain available through summer 2017 to allow a full academic year for transition of files, said Kim Braxton, academic technologies director in the Library and Information Technology Services division. 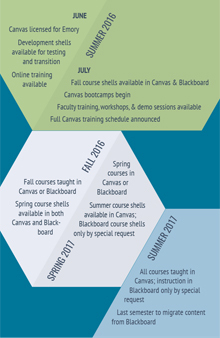 Pilot faculty who are teaching courses this summer can continue using the Canvas system for those classes. The transition is expected to be completed by the start of the fall 2017 semester. A comprehensive transition and training plan is in development that will include a wide variety of online and in-person training opportunities, as well as department-level and individual assistance for faculty, staff and students during the coming academic year. Training programs for faculty and students will be announced for the fall 2016 and spring 2017 semesters. The pilot, which concluded at the end of spring semester, consisted of 82 pilot courses, 77 faculty participants, 2,450 students and more than 100 sandboxes and organizations testing and evaluating the Canvas platform. Faculty and students participating in the pilot highlighted Canvas’s ease of use and intuitive user interface as key factors in preferring it over Blackboard. At the close of the pilot, survey data showed that 81 percent of faculty support switching to Canvas. In addition to providing a modern user experience for faculty and students, a move to Canvas will also align Emory with emerging learning management system standards and open technical architecture that will allow for more engaging and meaningful learning experiences. As part of Emory’s IT Governance process, the recommendation to move to Canvas was accompanied by a technical and functional assessment that was reviewed by the Digital Scholarship and Pedagogy faculty subcommittee and the IT Steering Committee, and unanimously approved at the end of April. More information about transitioning to Canvas — including timelines, training resources and frequently asked questions — is available on the Emory IT Canvas website. You can also find out more about the pilot program on the Canvas pilot website.